Am I the only one who can't believe it's February? Here I am still struggling to write 2016 on all of my documents, and we're already 8% of the way through the year! I came along kicking and screaming, but I made it, and I'm ready to start a new month. We've had a lot of new adventures in January, some I'll share more about next time, and I'm looking forward to a more organized, predictable February. 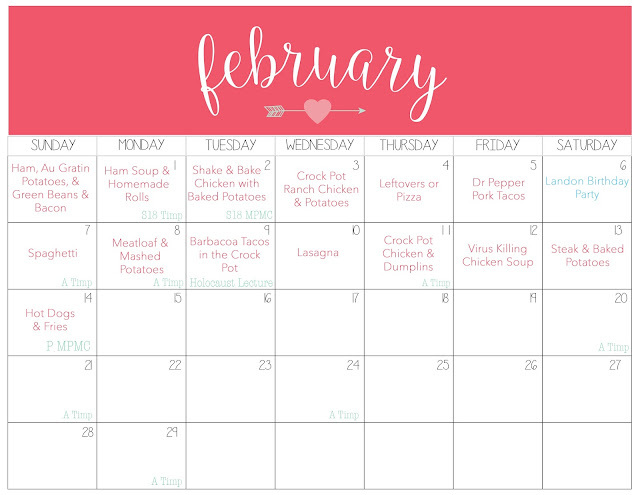 What better way to usher in an organized month than with a beautifully organized menu plan? Since both Jon's work schedule, and my own, are up in the air for the end of the month, I did a 2 week menu plan this time. I found an adorable set of printable calendars from Short Stop Designs, that you can find here. I love having these cute calendars on the fridge each month, and having my work schedule listed right on the calendar helps me to plan which meals will work best for our schedule each night. It also ensures I won't miss a shift, which I'm sure my coworkers appreciate! The Barbacoa Tacos, and Virus Killing Soup are new additions to the menu, and I'll be sure to update and let you know how they turned out! Everything else on here is a collection of staples that we love to eat over and over again. I must admit though, after making the menu plan, the grocery list, the price-checking list, and the miscellaneous errands list, my excitement for actually completing the shopping is greatly diminished. 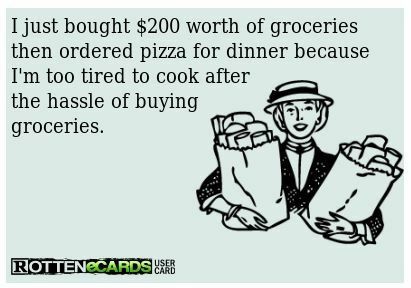 As usually happens on a shopping day, we'll probably end up ordering in tonight, in the spirit of one of my favorite Pinterest memes ever.